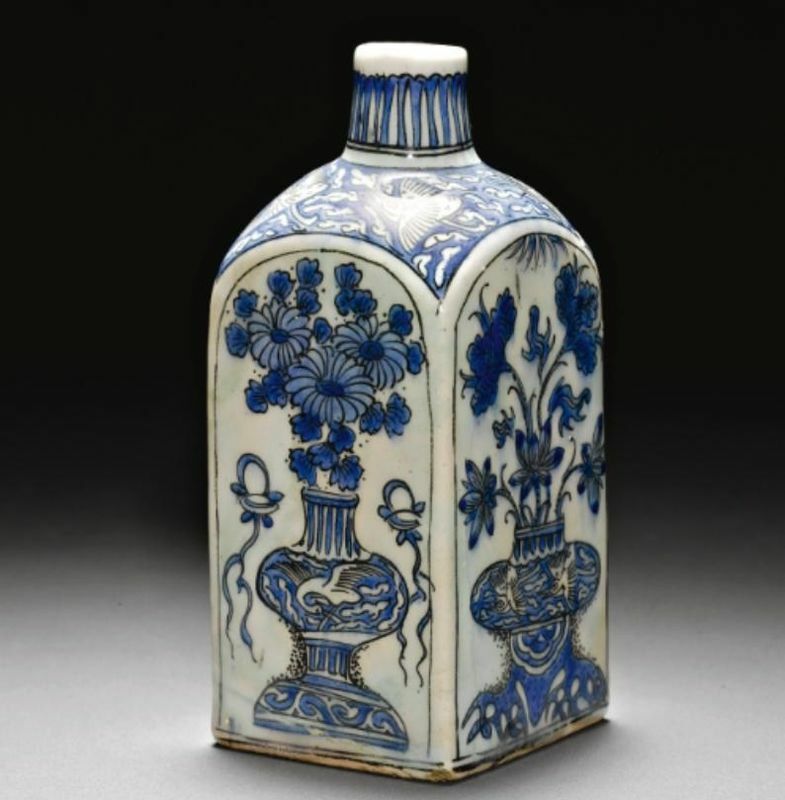 of deep form with rounded walls on a short foot, decorated in underglaze cobalt blue with a central medallion featuring a scrolling lotus flower, the body decorated with lotus flowers on an adjoining leafy scroll, with a band of mountain forms at the rim, the exterior with a similar design of scrolling lotus flowers; 32cm. diam. ESTIMATE 50,000-80,000 GBP. Lot 248 unsold. Note: The deep-form seen here decorated with lotus scroli on both the interior and exterior with minor bands of breaking wave and key fret pattern derives from an early Ming blue and white prototype, either from the reign of the Hongwu emperor (r1368-99) or Xuande emperor (r.1426-35). Two bowls in the British Museurri (mv. nos.OA 1947.7-12.180 and OA 1973.7-26.360), illustrate this Chinese prototype, see Harrison-Hali, J., Catalogue cf Late Yuan and Ming Ceramics in the British Museum, London, 2001, p133, nos.4:24 anct 4:25. Also, two similar examples from the Timurid period are illustrated in Lentz and Lowry 1989, pp.228 and 229, nos.130 and 131. 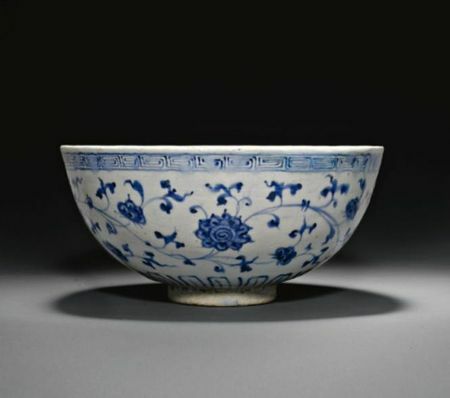 The rarity of this type of Timurid deep bowl is testified by the fact that no closely comparable example is found in the definitive account of Timurid ceramics Tamerlane’s Tableware (Golombek, Mason and Bailey 1996). Note: This large dish represents an interesting example of the adaptation by Persian potters of Kraak-ware ceramic models. Named after the Portuguese Carracks (boats) which transported these types of ceraniics, kraak-ware became one of the largest Chinese exports to Europe in the sixteenth/seventeenth century. 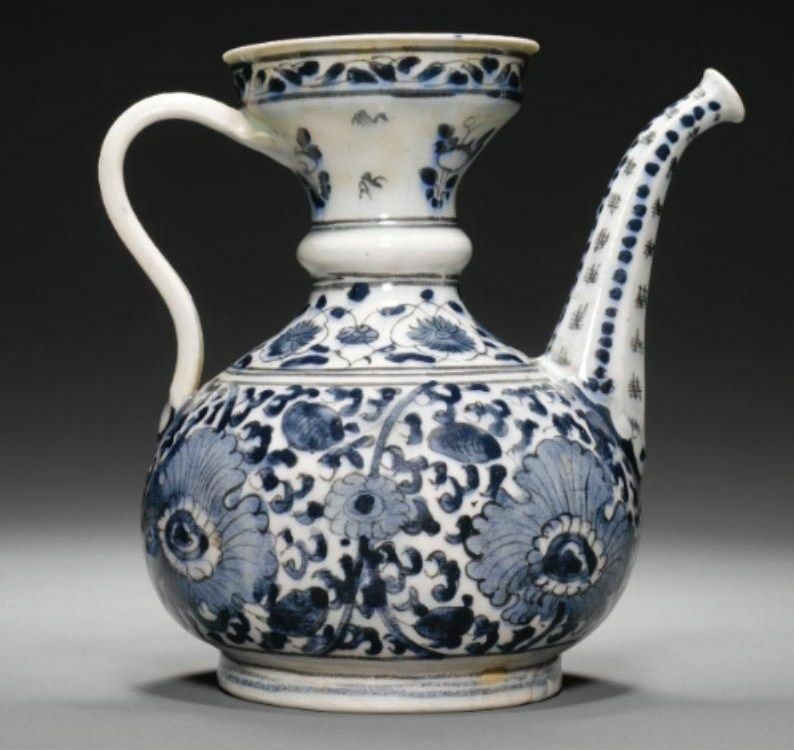 These ceramics were also widely known to Persian potters who re-interpreted their models to create their own beautiful ceramics. This particular dish features Adam without God or Eve, juxtaposed within a Chinese-style landscape of rocks and waterfalls. A discussion of similar examples of Safavid Kraak “petal panels” dishes can be found in: Y. Crowe, Persia and China: Safavid Blue and White Ceramic sin the Victoria and AlbertMuseum, 1501-1738, London, 2002, pp.6l-66. of deep rounded form, decorated in varying shades of underglaze cobalt blue and outlined in black, the centre featuring storks in a setting of rounded rocks, grass and a tree, with a cloudband border, the rim with a band of alternating geometric, scrolling and flying stork motifs, between roundels with stylized floral scrolls, the reverse with mountain and grass pattern and pseudo-Chinese marks to base; 40.5cm. diam. ESTIMATE 6,000-8,000 GBP. Lot 256 unsold. 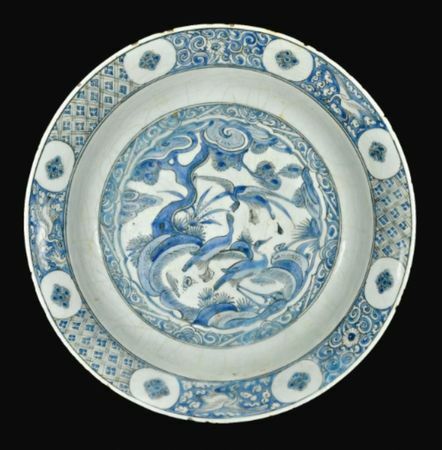 of shallow rounded form, decorated in greyish-blue with a central floral medallion encircled by four lotus palmettes enclosed by a leaf and tendril border, rim with breaking wave motif, the reverse with alternating chinoiserie and C-scrolls clay; 30cm. diam. ESTIMATE 15,000-25,000 GBP. Lot 366 unsold. 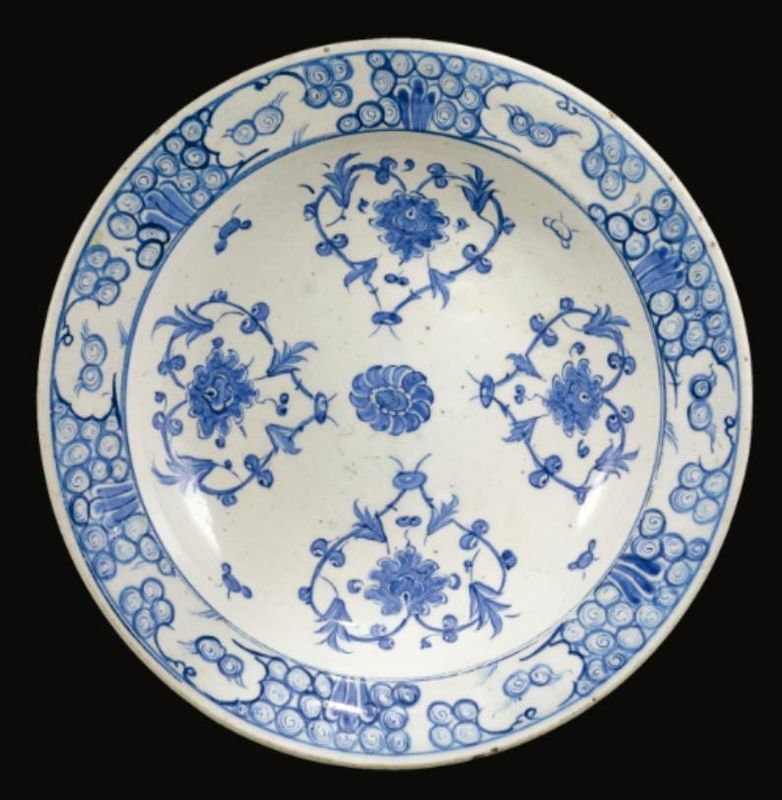 Note: This dish illustrates the fascination with early Chinese blue and white porcelains amongst the potters and patrons of lznik. 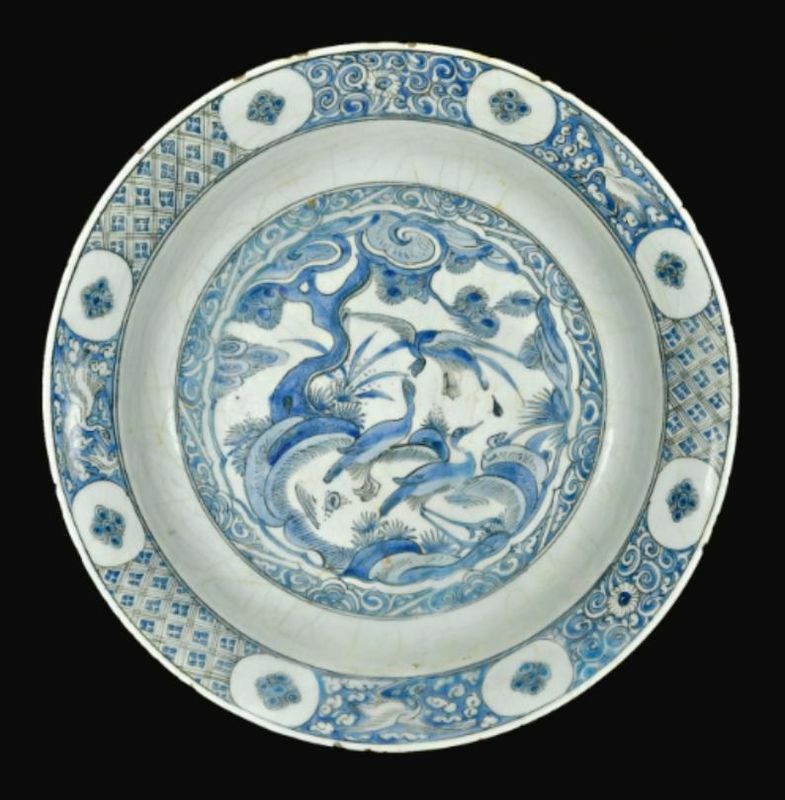 The origin of the design is an early fifteenth-century Ming dish such as the one in the collection of the Topkapi Saray (Krahl 1986, p.51 3, f0602). The flowers are different but of a kind found on other early fifteenth-century Chinese dishes (ibid., f0603). The design of our dish, therefore, draws on Ming designs from several sources, combining them to tremendous effect. A further element drawn from Chinese blue and white porcelain is the grey-b!ue colour ofthe design. 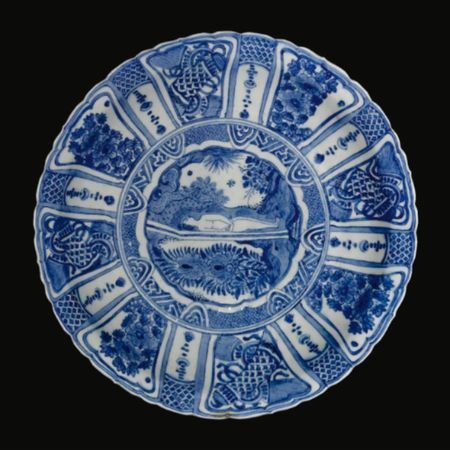 This appeared on Chinese pieces at times when they were forced to use local cobalt rather than imported sources. 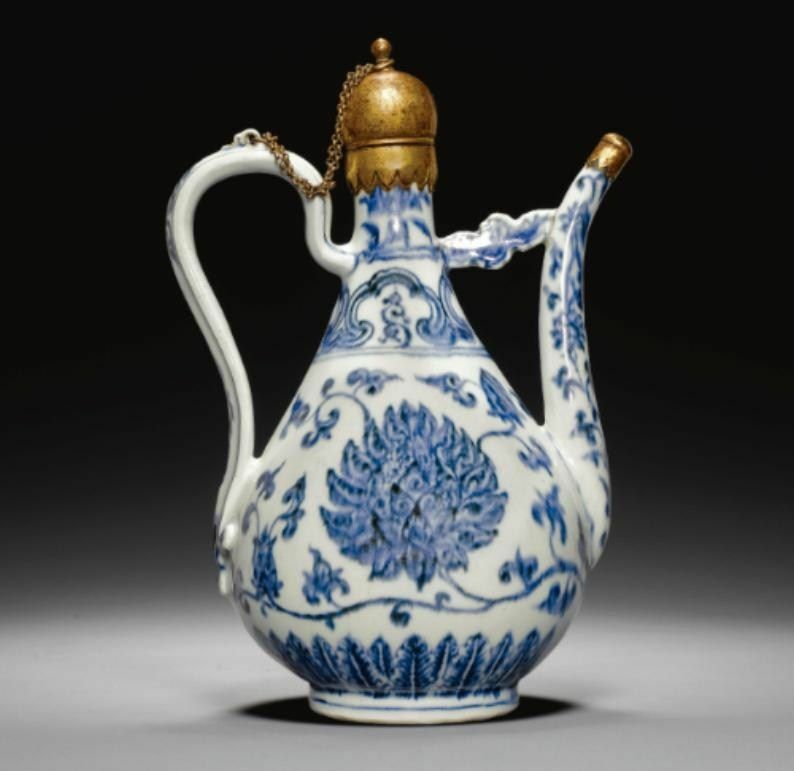 This did flot happen during the early fifteenth century which s a period noted for the consistently rich blue of its porcelain. 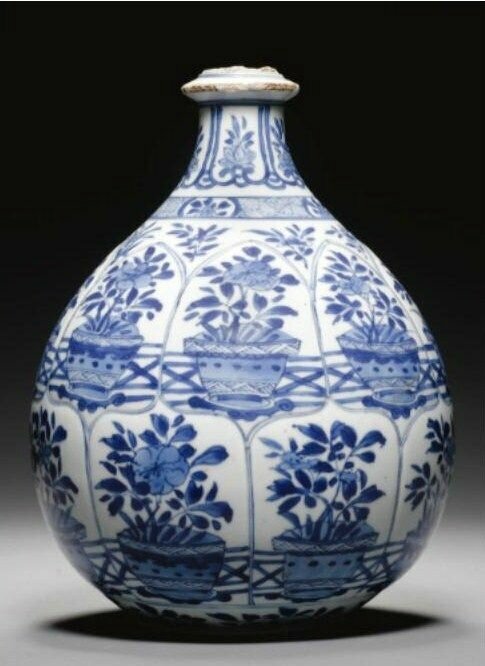 Hence, the decoration draws on sources of different periods and one may assume that this grey-blue was adopted to achieve a particular aesthetic for the piece.